A new technique for securing and storing carbon dioxide could help to unlock the North Sea's "vast" CO2 storage potential, researchers claim. 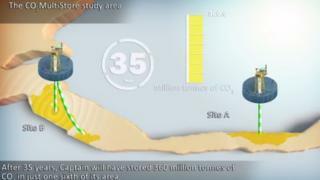 Experts around the world have been looking to develop techniques for Carbon Capture and Storage (CCS). This involves storing CO2 greenhouse gas emissions captured from power plants and industrial facilities in geological formations under the sea. Researchers said their new technique could store greater volumes of CO2. Project partners behind the CO2MultiStore study include Scottish Carbon Capture and Storage (SCCS), the Scottish government, the Crown Estate, Shell, Scottish Enterprise and Vattenfall. The study concluded storage within a single geological formation could be optimised by injecting CO2 at two points simultaneously. Researchers based their conclusions on a UK North Sea case study. They estimated the Captain Sandstone, an extensive sandstone formation which lies more than a mile beneath the Moray Firth, could securely store at least 360 million tonnes of CO2 in just one sixth of its area. The figure, which is estimated to equal the amount of CO2 emitted by Scotland's energy supply sector over 23 years, is based on carbon dioxide being injected at a rate of between six and 12 million tonnes per year over 35 years. The UK government has described the development of CCS at coal and gas-fired power stations as "essential in mitigating global climate change". However, progress has been slow in commercialising the process. The government is currently considering bids from Peterhead's gas-fired power station in Aberdeenshire and Drax coal-fired power station in North Yorkshire in a £1bn competition to encourage the development of CCS technology. A decision is not expected until early next year. Dr Maxine Akhurst, from the British Geological Survey, which led the CO2MultiStore project, said: "Our study is one of the keys that will unlock the potential CO2 storage capacity underlying the North Sea and release this immense storage resource. "Our results show that by using more than one injection site in a single sandstone, operators can store greater volumes of CO2 compared to using a single injection site, so increasing Europe's capacity to reduce greenhouse gas emissions." Scottish Energy Minister Fergus Ewing said: "This research confirms how the huge CO2 storage resource potential beneath the North Sea can be optimised, which, combined with the infrastructure already in place, again reinforces the huge opportunity for Scotland around CCS. "CCS can contribute significantly to the diversity and security of electricity supply, and also has a unique role to play in providing a continuing supply of flexible clean fossil fuel capacity that is able to respond to demand in the way that other low-carbon technologies cannot." He added: "Many experts have set out the case that in order to achieve global climate change progress, CCS technology must be developed and implemented to generating stations. "We will continue to work with a range of partners to firmly establish this cutting-edge technology in Scotland, making full use of our huge potential." Environmental group WWF Scotland, however, cautioned against relying on the technology to achieve climate change targets because its development so far had been slow. WWF Scotland director Lang Banks said: "While a better understanding of the techniques that might one day be used to store carbon is important, there's no guarantee that the technology will be commercialised and rolled out in time, meaning Scotland's climate targets could easily be missed. "Although we'd still like to see CCS tested at Peterhead, given how slowly this technology is progressing, it would make sense for ministers to also explore alternative paths to cutting carbon. "Independent research has shown not only is a renewable, fossil-fuel free electricity system perfectly feasible in Scotland by 2030, it's actually a safer bet."